It's been 28 years since the last Tron film, enough time for movie reviewers to build up a healthy amount of indifference to its sequel, Tron Legacy. But some movie buffs enjoyed portions of the newest Tron. Let's find out who! The general consensus on Tron Legacy, opening this week, is that the Joseph Kosinski-directed sci-fi fantasy film is visually and aurally rich, but emotionally empty. What did the critics think? 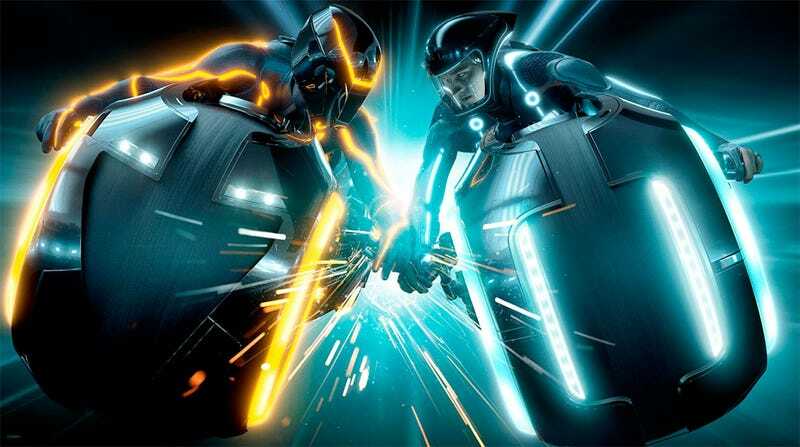 Read on for six takes on Tron Legacy and the only time (promise) I'll put myself on a list with Roger Ebert. Visually light-years ahead of the 1982 original and yet strangely old-fashioned in the story department, "Tron: Legacy" plays like the world's most impressive screensaver — a flashy, fetishistic showcase of what bikes and bodysuits might look like in a future designed by renegade Apple employees. While 21st-century effects and a cutting-edge dance score make this a stunning virtual ride, the underlying concept feels as far-fetched as ever. As long as it's engaged in light-hurling bouts of force, or motorcycle chases through a landscape so ominously enveloping it looks like Blade Runner after gentrification, TRON: Legacy is a catchy popcorn pleasure. The movie has a seductive, percolating, what's-old-is-new-again musical score by the French electronica duo Daft Punk, and for lengthy swatches of it I grooved on the look and the atmosphere. Joseph Kosinski's direction is just intriguing enough to leave you hoping that when Sam finally locates his father amid all those irradiated bytes and bits, the story will really take off. But with everything awash in all that lovely light, it's hard to feel that Sam, or anyone else for that matter, is in real jeopardy. And you wonder if the actors were blinded a bit too. They move through their paces with an OS X efficiency, but not nearly enough heart. The artificial world is wonderfully well-rendered, building on the earlier film's ability to bring visual excitement to what must in reality, after all, be slim pickings: invisible ones and zeroes. I soon topped off on the thrill of watching Frisbees of light being hurled, but some of the chases and architectural details are effective simply because they use sites and spaces never seen. And the soundtrack by Daft Punk has such urgent electronic force that the visuals sometimes almost play as its accompaniment. It might not be safe to play this soundtrack in the car. The plot is another matter. It's a catastrophe, short-changing the characters and befuddling the audience. The concluding showdown follows the usual action beats, a disappointingly generic turn, particularly given that voluptuous programs called the Sirens suggest that the screenwriters Edward Kitsis and Adam Horowitz were out for more. Although the story pivots on Sam's search for his father, the power struggle between Kevin and Clu indicates that the writers, both veterans of the television show "Lost," were interested in creating a computer-world mythology in which users (humans) and the programs they have created play the roles once performed by gods and men. Tron: Legacy offers plenty of thrilling action, breathtaking people and places to gawk at, as well as a rock solid score from Daft Punk, but doesn't engage with a particularly meaty tale. Legacy delighted the eyes and ears, but its players were forgettable, disposable, shiny plastic things that you can't take your eyes off of.